Zyom provides a set of capabilities for Product Companies to achieve Demand Responsiveness harmonizing it with Profitable Operations across lifecycles. 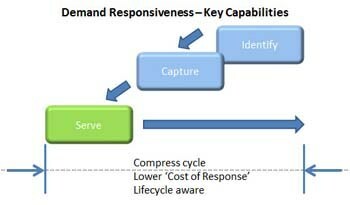 What is Demand Responsive Operations? Quickly implies achieving desired customer delivery dates or commit dates. Intelligently implies profit is optimized (maximizing profit in the context of the specific channel or customer demand and lifecycle). Why is Demand Responsiveness critical? Companies that sell through Distribution or other Indirect Channels struggle to connect the dots between the Channel Demand signals and execution across the Value Network. Often, this is due to limited Business System capabilities to support Operations, or process gaps, or a mix of the two. Companies that fail to be Demand Responsive experience Unpredictable Channel availability of their products, higher ‘cost of response’ and diminishing margins, eventually eroding demand and diminishing its competitive standing. Response- Proactive alert across functions? Planned or unplanned obsolescence? Response- Available to Ship? Real time options analysis?